It's impossible to separate Tulsa from oil. Oil put Tulsa on the map and it was oil that spurred the growth of Tulsa from the discovery of the Glen Pool in 1901 until the oil crisis in 1986. The postcard picture below was taken from the west side of the Arkansas River looking east across the river at Tulsa's skyline. It all started with Josh Cosden of Tulsa, Oklahoma in the mid teens. Mr. Cosden, a prominent businessman and local celebrity in Tulsa, is briefly described in an article from the Harvard Business School: "Known as the "prince of petroleum," Cosden is credited with establishing Oklahoma as a major oil producing state. Starting with a small parcel of land, he built a $35 million oil business in ten short years. Through his oil discoveries and exploration, he almost single-handedly quadrupled the population of Tulsa at the turn of the century." Mr. Cosden established Cosden Oil & Gas Co., building its new headquarters building (called the Mid-Continent building) in 1916. Mid-Continent Petroleum Corporation was organized as Cosden & Company, a Delaware corporation, in 1917. 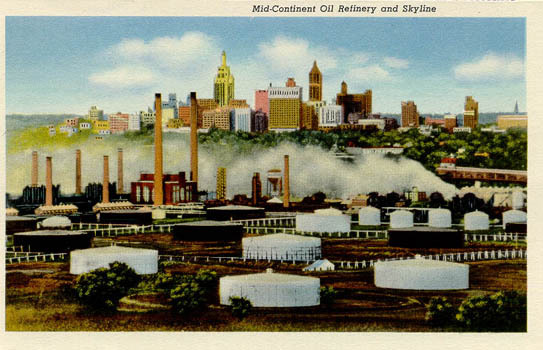 Various Cosden holdings were re-incorporated as Mid-Continent Petroleum during a forceful restructuring that took place in 1925. It was at this time that the Mid-Continent building in Tulsa officially became the headquarters of the Mid-Continent Petroleum Corporation. The beginning of the refinery. 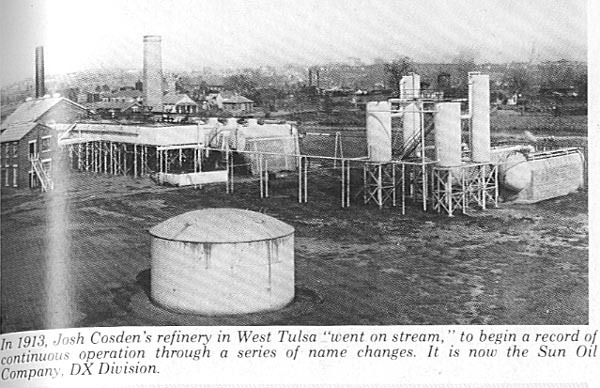 Caption reads: "In 1913, Josh Cosden's refinery in West Tulsa "went on steam," to begin a record of continuous operation through a series of name changes. It is now Sun Oil Company, DX Division."